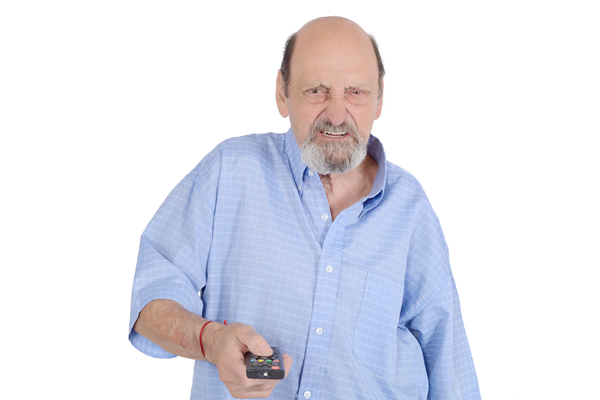 It’s time to protect older Americans from the dangers of cable TV. When I was a teen, my little hometown back in Arkansas took the extraordinary step of banning MTV, claiming it was a corrupting influence on the young. It was all very similar to what went down in that town from the movie “Footloose.” For years, we suffered through VH1, which at the time was MTV’s lamer, tamer cousin. That was more than 25 years ago or so. And much has changed for my hometown, and many hometowns that us gays will find ourselves returning to this holiday season. While the cities we fled to get bluer and bluer, the hinterlands we came from seem to be getting redder and redder. For my home state of Arkansas, once itself having a proud progressive history, nowadays I hardly recognize her. Her politics are getting more and more conservative with no turnaround in sight. It turns out, this entire time, it wasn’t necessarily MTV that had the corrupting influence on a generation, and the young seem no more depraved than anyone else. It seems the older generations proved far more vulnerable to cable television, specifically Fox News, a station where the No. 1 goal seems to be to scare the crap out of older people with visions of marauding caravans and reporters karate chopping young White House interns. What I am suggesting? Well, it’s easy. With Thanksgiving just around the corner, and while us gays are home for the holidays, it’s time to take some steps to protect our vulnerable older Americans from the depravity-spewing Fox News. Let’s all just take the remote, wielding that powerful option once meant to shield us from too much adult content, the parental control feature, and turn it on its head. Simply — let’s all agree to block Fox News from our parents’ televisions while we’re home. I know what you’re thinking, won’t they be suspicious when they try to tune in for their daily dose of rage, vitriol, and sheer paranoia, and the only thing they find is static? Well, when this happens, let’s all take a lesson from how the Chinese government handles blocking websites and such. For instance, don’t say, ‘yeah, I blocked it, it’s for your own good.’ Try instead something like, ‘gosh, how odd, it’s just not working right now. . .huh. . .who wants to go to Cracker Barrel?’ Or insert whatever your version of Cracker Barrel is for you and your family — think your Belks, your Marshalls, your Bass Pro Shops. Do not suggest anything that requires physical activity. That’s a nonstarter. I predict this sleight-of-hand will be highly effective. And I guess I should say here that in full disclosure my parents back home, Bear and Lulu, are proud yellow dog Democrats. Most of the phone calls with my Mom begin with her saying something to the effect of “Gawd, can you believe Trump?” Despite that, it’s often been tossed around that if gays don’t like the politics back home, they should move back there and do something about it. Well, that’s just silly. First of all, it’s not always on us to fix things. We’ve fixed plenty, believe me. Beyond that, gays need damn near saturation of other gays or else we’ll go crazy. But, when we go home, and indeed when we’re visited by family here, we do have an enormous amount of influence on how they see us and the world; and that’s usually a message of love, acceptance and sheer fabulousness. But, in this Age of Trump, it’s fine to play a little dirty. So when you find yourself home with family this holiday season, do us all a favor, and especially your parents, and do some content blocking. Brock Thompson is a D.C.-based writer. He contributes regularly to the Blade.